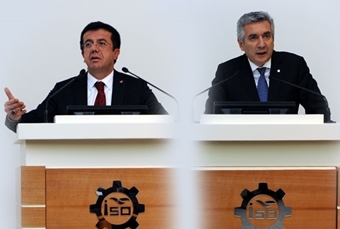 The Board Meeting of the Istanbul Chamber of Industry on "The Export-focused Economy and the Future of our Industry in response to the New Industrial Movement" was held on November 26, 2014 with the participation of Minister of Economy Nihat Zeybekci. Presided over by İSO Board Chairman Zeynep Bodur Okyay, the meeting featured a talk by İSO Board President Erdal Bahçıvan, who shared with the Minister İSO's recommendations for 9 solutions to 9 important issues. Economy Minister Nihat Zeybekci then addressed the large turnout of industrialists at the meeting and gave them good news about the Resource Utilization Support Fund (KKDF), an issue that they had been bringing up for many years. Minister Zeybekci said that the matter was now on the agenda and that preparations were being made to abolish KKDF from certain processes, particularly from production-based processes. The industrialists responded to this good news with a long round of applause. The Economy Minister also said that participation in the Customs Union, which was in its 18th year, could not be continued in its present form and would have to be revised. Pointing out that at the time the agreement had been signed, Turkey had participated with the view that it would soon become a member of the EU, the Minister said that in the time that had elapsed, the agreement had contributed a great deal to Turkish industry. He said however that it was now necessary to review the agreement. Calling out to the industrialists, Minister Zeybekci advised that if Turkey was to meet its 2023 targets, it would have to move out into the geographies with which it had a cultural affinity. Zeybekci underlined that the Turkish economy and the industrialists could define the concept of consumption in these areas. He said, "We can manage consumption networks in these areas in particular. It will only be in that way that we can meet the targets for 2023. We can be in first place in many areas." Delivering the opening speech at the meeting, İSO Board President Erdal Bahçıvan offered, on behalf of the Istanbul Chamber of Industry, recommendations for 9 important issues that were of interest to industry, the industrialists and to the Economy Ministry, presenting these under 9 headings. 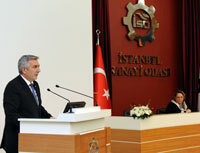 One of the main issues İSO President Bahçıvan spoke about in his speech was the matter of the Customs Union. Bahçıvan summarized these 9 important issues as "The Customs Union and the free trade agreements, exports, financial stability, incentives, foreign capital, KKDF, development banking, the investor's tying his capital to land and buildings, providing employment incentives in industry and protective measures." Bahçıvan said that after we joined the Customs Union in 1996, we experienced problems that stemmed from our inability to complete the process of full membership in the European Union. Bahçıvan said, "At a period where the Free Trade Treaty is gathering momentum, Turkey's situation is no longer sustainable because of its issue with the European Union and the Customs Union it has been a part of for 18 years. We believe that it is time for 2015 to be the year for the customs union. Accordingly, the Customs Union should be revised in a way that will eliminate the adverse effects of the Free Trade Treaty so that its scope is expanded to meet changing conditions of trade." "On behalf of the Istanbul Chamber of Industry, I would now like to talk about some of the issues that our industry and industrialists face that have to do with matters within the jurisdiction of your Ministry. I will share with you our recommendations for solutions under nine headings. First of all, I would like to talk about the Customs Union and the Free Trade Treaty that has developed beyond our control and about its possible adverse effects. After we joined the Customs Union in 1996, we continued to experience problems that arose from our inability to complete the process of full membership in the European Union. At a period where the Free Trade Treaty is gathering momentum, Turkey's situation is no longer sustainable because of its issue with the European Union and the Customs Union it has been a part of for 18 years. The process that Turkey is in at this time should no longer be treated with short-term fervor but discussed transparently with all related stakeholders. When we say that the issue should be put on the table concretely and objectively, we mean to say that the matter should be analyzed with shared wisdom and common sense and a new road map should be drawn up. We believe that it is time for 2015 to be the year for the customs union. Accordingly, the Customs Union should be revised in a way that will eliminate the adverse effects of the Free Trade Treaty so that its scope is expanded to meet changing conditions of trade. At this point, in the context of the Customs Union, I would like to call your attention to the fact that the Transatlantic Trade and Investment Partnership between the US and the European Union has gained momentum. If Turkey remains outside of this treaty, it will experience problems in its trade with these two giant blocs. For that reason, the necessary measures should be taken immediately to prevent a swerve in trade and the further deterioration of bilateral trade relations that would lead to billions of dollars of loss for Turkey annually. At such a time, we find it very important that our Ministry of Economy sign and put into force a Free Trade Treaty with South Korea, a Preferential Trade Treaty with Iran, and an Economic Partnership Treaty with Japan. It is also of vital importance that our Ministry complete discussions for a Free Trade Treaty with Malaysia, continue the same discussions with Singapore, and be in close contact with Russia to create a Eurasian Customs Union. We believe it will be useful for the private sector to be a part of the FTT discussions that are being conducted by our Ministry of Economy and that in particular, the impact analysis and other studies of the effects of FTT's on our foreign trade are kept open to the views and contributions of the private sector. As the Istanbul Chamber of Industry, I would like to make it clear that we will ready to make any contribution we can to this process. The second topic I wish to talk about is the matter of exports. Export targets, which form the basis of the country's 2023 goals, are constantly being revised and brought down through medium-term programs. The exports target in the exports strategy document for 2018 was 286 billion dollars but in the 10th Five-Year Development Plan, the exports target of 275 billion was brought down to 220 billion dollars with a Medium Term Program. The actual increase in exports over 2008-2013 was 20 billion dollars, representing a figure that was both below the targets of the exports strategy document and also much behind the exports performance of many other countries in the same period. In the light of the developments that I have mentioned and when all global economic conditions and the status of our markets are considered, it can be seen that exports need to be supported much more comprehensively. Besides the fact that company performances and the sustainability factor are taken into account in export incentives, we also see that the ministry's support of exports is very poorly reflected in our industrial goods. We believe that it will be beneficial if the share of government support could be increased to 1 percent of total exports so that the industrial sector could receive more of a share. Again in this context, more will fall upon the shoulders of Turkish Eximbank, which has been supporting successful applications of exporters recently, particularly with their concept of management. It is of vital importance to our economy and our industrial sector that Turkish Eximbank continues to increase the medium-term loans it extends to support the export of products of high added value, providing manageable interest rates and convenient collateral terms. As a third topic I want to say that, as we always stress, financial stability is our industry's most important value. I would especially like to emphasize in the light of this financial stability, our need for a predictable and competitive exchange rate. In this context, I would like to stress as well that as a result of the fall in oil and commodity prices, the expectations of improvement in the current accounts deficit is a promising development in terms of our economy. However, we also believe that for the sake of our economy and our industry, this process must be managed with an approach that does not cause a TL overvaluation in the short term. Our fourth heading is the issue of incentives: In an effort to keep up with developed countries, Turkey has targeted a growth model based on production and exports. This type of growth model can only be attained by a transition into an industrial structure of more concentrated know-how and technology where the level of added value is high. For this reason, Turkish industry needs to turn its face toward medium- and technology sectors with high added value. This transition will be possible only with a new system of incentives that is based on a new understanding. Besides the present regional and sectoral incentives, an incentive system based on high-tech projects that produce high added value should be adopted. And on the same subject, I would like to underline the importance of foreign capital. I would like to mention in particular that we place great importance on bringing in long term or permanent foreign capital that will produce hi-tech products and create awareness. We believe that public procurement policies in this area will serve not only to provide incentive for foreign capital, but also to create an opportunity for local capital to flourish. As my fifth topic, I would like to mention the issue of the KKDF (Resource Utilization Support Fund), which has been reducing our industrialist's competitive power. To have our industrialists' scarce capital resources flow into KKDF is unfair. Having credit limits being used not for production and investment but for KKDF is not making anyone happy. To protect and increase the competitive power of our industry, KKDF should be completely removed from imports, consumer products should be kept outside of its scope, KKDF should be completely abolished from the import of raw materials and investment goods mentioned in the capacity reports, and industrialists should be given the chance to import without paying KKDF on the basis of their capacity documents. The sixth heading I will talk about here is the matter of Development Banking. Development banking should take on the necessary and important role of ensuring that our industry sustains its growth by producing. It would be a big mistake to assume that successful industrialization stories in developed countries only came about because of private sector banking. In every country that has grown by industrializing, we will always see the developmental, all-encompassing and supporting perspective of the public sector. This is the job of Development Banking. Turkey must under all circumstances create a model of development banking that will support its industry. The Turkish Development Bank must return to its fundamental duty, the task for which it was initially founded. As the seventh heading, I wish to speak about the matter of the investor tying his capital down to properties and buildings. Just as Emlak Konut (Real Estate Housing) is an enterprise devoted to establishing housing on state property, the same model can be initiated for the industrialist. An enterprise, which we can name for example, Emlak Sanayi (Real Estate Industry), may allot suitable state properties to the private sector on a project basis. The private sector can pay the monthly or yearly rent of these pieces of real estate to Real Estate Industry over a period of 49 years. Forty-nine years later, the property can be transferred to the company's assets under certain determined conditions. The most beneficial part of this is that the property will be guaranteed to serve the factory for a period of 49 years. This way, the area will no longer be a place that the factory owner can use for a housing project in the first 10 years because of the profit it promises. We believe it will be beneficial not to waste any time in putting together the necessary regulations so that investors do not tie down their capital to land and buildings. The eighth heading I wish to talk about is the subject of providing employment incentives for industry. In this last period, many of the masses that will be entering the work force do not consider the industrial sector a preferred working place. The essence of the problem of employment in industry is: Not being able to draw enough of the work force into industry! This is an important risk that needs a solution, both in terms of the industry and in terms of the employment market. The key role that industry plays in employment should never be forgotten. Because of this, Turkey needs to focus on the distribution of employment in the sectors and take measures to stop the trend of drawing away from industry, and make industry an attractive area to work in. As our ninth and last topic, I would like to mention the protective measures that are such an important political vehicle in terms of international trade. It is with great pleasure that we observe the protective measures that our Ministry has implemented with regard to the import of industrial goods for consumption in particular. However, we can see that additional burdens are placed on the import of some of the basic items of input used as intermediate goods in industry and that this constitutes a major competitive disadvantage for those in industry that use these intermediate goods. Now I would like to use this framework to call your attention to two issues faced by steel and plastic producers: In 2009, to protect our country's steel producers from the adverse impact of the global crisis that had started in the world, the customs taxes applied to the import of steel products had been raised. This precaution has had a negative impact on the competitive power of different export-geared sectors that use flat and stainless steel products as input. Although the capacity to produce flat products in Turkey has increased in recent years due to the activation of new facilities, a large part of the domestic demand is still being met through imports. To eliminate the raw material shortages that our sectors face, we believe the customs taxes that are now being applied to flat steel products should be abolished. We can see that the protective measures adopted for some products in the import of plastic raw materials have added costs to the plastic industry using these raw materials, thus having an adverse effect on the competitive power of our industry. We feel that it will be beneficial to lift the protective measures in the sector."